Warning to Spiritual Abuse Community regarding bloggers who may use commenters’ private email in an intrusive manner. An unfortunate situation with misuse of commenters’ personal email addresses has come up in the spiritual abuse survivor blogging community. It has made people feel unsafe. My response was to start to write a post about “blogger etiquette.” But really, the more I thought about it, I believe the underlying issue is not etiquette, but intrusiveness and even potentially invasion of privacy by blog owners and moderators. So this is what I’m writing about instead, and I’ll need to get specific because one of my main concerns in “defending the sheep” is to do what I can to protect spiritual abuse survivors. Many of us have been stalked, shunned, watched, put on notice or under surveillance. We don’t need someone potentially violating our email in-box with their unsolicited email contact! Above is a partial screenshot of what I see on the Comment page of the WordPress blog platform. This is the personal information that is shown on my own comment. You can see my User ID “Julie Anne,” my website address “spiritualsoundingboard.wordpress.com,” and my email address “spirituals@gmail.com.” Beneath my email address is my ISP address (not shown on the screenshot). This is the identifying information that I see on your comments, as well (you may not have listed a web address). So, here is the problem (and at the end I’ll have several suggestions for making our commenter status safer). 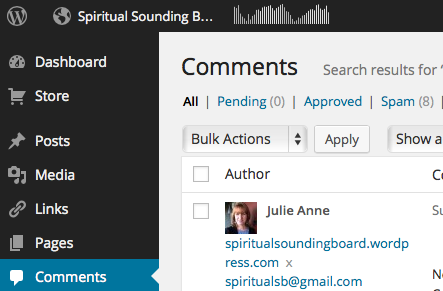 Blogs like Spiritual Sounding Board (SSB) which use the WordPress platform require people to give an email address in order to leave a comment on a post. Many abuse survivors use pseudonyms for their commenting, and that certainly makes good sense. But they often also use their regular personal email address since those don’t show up in comments, and only blog owners and moderators can see them. And it turns out this is not necessarily a safe choice for us commenters, on some blogs, at least. It has come to my attention that a particular blog has used commenters’ personal email addresses for unsolicited contact – sometimes repeatedly. Specifically, the problem is with “Jen’s Gems” (a blog which uses WordPress and deals with the saga of Doug Phillips, Vision Forum, and Boerne Christian Assembly issues) and T.W. Eston who both posts and moderates there. Mr. Eston has contacted people by using their commenting email address to get more information from them or to ask them to do favors. I have seen proof of this, as emails were forwarded to me by survivors who were creeped out by his actions. T.W. and Jen’s Gems, this is an intrusive practice – please stop! I do not know any commenters who think they gave you automatic permission for follow-up contact, when they shared with you their unpublished email in order to leave a comment. Also, stop contacting other bloggers and commenters and asking favors, such as when you asked me for one of my own commenter’s email addresses. That is unethical and unprofessional, and a violation of my responsibility for my commenters’ privacy. To Spiritual Sounding Board commenters: When you left a comment here, did you have any reason to think that gave me permission to share your email or connect you with a third-hand party who was interested in more details about your comment? Didn’t think so … and I am very careful to guard your personal information. I felt the need to share this – and be specific – because many who read here might read Jen’s Gems as well because of their posts on stories related to Doug Phillips. So, please be aware that if you post comments at Jen’s Gems, they have your address and you may be contacted by email regarding your comments. I offer two suggestions if this privacy issue is a concern to you. First, you might want to use a different email account for comments, or even create a new email account just for posting purposes. Second, I would also recommend being very careful about your ISP addresses (use library, cells phone) when leaving comments. **This article was a team effort by Brad Sargent/futuristguy and JA. Thanks, Brad! Sorry. Feel free to edit my comment, if that’s possible, and delete (Mod deleted content here). Sorry I said that part. Wasn’t nice. JA, I’m a regular reader here and on Jen’s blog and I’ve been helped and encouraged by both. I agree with your general sentiment that an abuse survivor may feel uneasy with unsolicited contact. Repeated contact after saying “enough” is downright pushy. However, I feel a little defensive of Jen’s blog because I think you’ve shamed her in an unnecessary way. She’s had this sort of thing done to her by her abusers, so it isn’t surprising that she is reacting in a defensive way. I’m disappointed by this whole controversy because I think both blogs have done a lot of good and I hate to see division over something that could most likely have been handled privately before going public. RB, You are exactly right. And that blog appears to go beyond “warning” and discussing the spiritual abuse of DP’s ministry/business to seeking information to prove allegations. A different enchilada! Gail, I am glad you are here anyway. And I hope you have learned something from this that will serve to protect you on other blogs out there. Some learn it the very hard way. And I read JA at her old blog and now here for almost a year before I commented. I have seen enough of the “Darwinian” Christians on the blogosphere to last a life time. Those are the survival of the fittest types that harp: if you did not know then your ignorance is your fault so we can do what we want with the information you trusted us with. I found JA to be very respectful over a long period of time. GG, I did not link to my comment because as noted I copied the comment left on Jen’s site and pasted it here on Julie’s site where is was received warmly and widely discussed on November 21. That conversation went on for weeks with many here reading and commenting. In that comment or shortly there after I mentioned that I had first attempted to leave the comment on Jen’s site but it was rejected. So you did not “discover” something here that I was trying to hide or that many had not already seen. I think that thread had over 300 comments and my comment regarding race and Rushdooney was a large part of that. Further, if you read my comment above concerning T.W.’s response to me you will see that I state that I had several friends (all white by the way) contact me stating that they believed T.W. may be a kinist. I then state that after watching the way T.W. treated others who commented I came to the conclusion that my treatment was not race based at all because the bad treatment was extended to MANY others. GG (8, 9:34pm) if you receive many bewildering insults throughout your life, and they turn out, say 80% of the time, to be because you have white skin, your automatic first thought to an incomprehensible rejection will be “Here we go again.” We learn by experience. But what Hendersonfamily4 said was that he/she checked with others and then did some research on it and realized that this was a pattern of response and that it was not necessarily racist. Then he/she made a generous conclusion and explained that process in a comment here. It is impressive and I have much respect for Hendersonfamily4. That you immediately jumped to a different conclusion without carefully reading what was written shows that it is you who pulled the (anti) race card canard. You also drew from past experience but yours was a much less personal, vital and conclusive experience than that of Hendersonfamily4—in fact, more hearsay than personal experience. And you jumped to a conclusion that was the opposite of generosity. It would be very good to learn the process that Hendersonfamily4 presented. Christians in general (and I’m not talking to you here, but all of us) are in deep need of this process, especially when confronted with criticisms by those outside the faith. Instant claims of persecution are foolish. TW does some of the same “instant jump” insofar as he immediately claims victimhood and turns to attack, even including veiled threats. This is never a useful way to handle disagreements, insults, criticisms. And it really has nothing at all to do with Christ. @Julie Anne Of course if I told a blogger not to contact me and they continued to do so that would be a completely different story. However if it was TW I would have contacted Jen immediately and given her the chance to handle it. Many people have publicly aired their concern about Eston’s behavior on this thread, over at Jen’s Gems for some time now, and I’ve seen it discussed elsewhere. This is a public situation as well as private, and what is Jen’s response? Defend Eston. I apologize to TW for my statements yesterday, which only added fuel to the fire. It doesn’t help to speculate about the identity of the messenger, when there is an important message to get out. I was wrong, and I’m sorry. Henceforth, I will confine my speculations to the parcel of rogues who are currently distancing themselves from Phillips, pretending they held him accountable, pretending they didn’t know what they knew when they knew it, and proceeding with business as usual while hoping to rake in Doug’s share of the market. If these guys would tell the truth, folks like me, JA, Jen and TW could stop speculating. There are a few comments being held in moderation. Long-time readers know that I rarely hold comments in moderation – even ones in which I am criticized. However, I have had some people suggest to me that there may be a “sock puppet” trying to disrupt the blog. A sock puppet is someone who uses a different online identity in order to deceive – essentially, they come to a blog to stir up trouble. If your comment is stuck in moderation and you are not a sock puppet, feel free to contact me at spiritualsb@ gmail dot com to discuss this with me privately. I may be convinced to publish the comment – – or maybe the comment can be reworded. I think TW Eston and Frank Vance (another alias) are the same person. Look it up. That explains his savvy and longstanding relationship with Jen. I am so very tired of seeing him threaten other people. Doug Phillips is the ultimate tale of how power corrupts, but you know what, it cuts both ways and two wrongs don’t make a right. The tone of jens blog changed a lot when TW showed up and it feels like he’s running his own little fiefdom over there, bashing anyone that dares to question the king. "For some reason she has taken a personal dislike to me…" <— Could it be because of your abrasive, threatening tone on your blog and this one? "Feel free to continue commenting in Julie Anne’s defense, but I can promise you it won’t go in her favor." <— Zippity, zip, zip it… OR ELSE! "I’ve extended the hand of Christian fellowship…. We’re willing to forgive and move on…. it’s entirely in Julie Anne’s hands where we go from here." <— I've threatened you… but I'm a nice guy… but you better zip it. "Well Julie Anne, I was hoping not to have to go there, but you leave me with little option at this point." <— I've threatened you… you didn't obey… now you will pay. Unlike TW Threatston, JA proves that you don't have to stoop to threats, half truths and personal attacks in order bring light to this story. Keep up the good work Julie and don't I know it need not be said… but don't every let a bully win, it only makes it worse for everyone else they meet in the future. Thanks for confirming that I’m being censored. Nice excuse too that I may be a sock puppet. Had to look that up. Very classy. I don’t know how this is suppose to be a place of healing with this kind of treatment. You have the last word. I’m done here. GG, “class”, by which I suppose you mean civility/courtesy, isn’t something I’d be appealing to, if I were you. I think GG’s post this morning originally went into moderation because of a keyword that was used, not for any other reason. But . . . . after reading it while it was in moderation, I decided to not publish it and stew on it for a while after considering the concerns that others had about sock puppets. And now you know . . . the rest of the story. GG, I also didn’t know what a sock puppet was. Which is why it is WRONG to assume commenters (even long-time commenters) know anything about the internet, unwritten rules/policies, blogging/commenting protocols. The only think one can know for sure about them is what they type in their comments! Look, blogs for spiritual abuse victims must know, even expect their commenters are commenting with incredible courage. Commenters may be stepping out on a limb. They may be nervous. They may still be afraid, have flashbacks, etc. They may be in current danger. Anonymity may be the only reason some may comment. These blogs may be the first place and only forum they feel comfortable sharing their experiences. Spiritual abuse blogs NEED to treat their commenters with extreme care. Period. Even more than what run-of-the-mill discussion blogs might do. Personally, I would be taken-aback if I were contacted via email, unless I gave clear permission to allow so ahead of time. I can’t imagine how it might scare the boots off someone wanting only to voice their opinion or experience, with zero contact. WHAT IF THEIR ABUSER (HUSBAND, PASTOR, ELDER, FRIEND, PARENT, ETC.) HAD ACCESS TO THEIR EMAIL? HELLO? These blogs REQUIRE email address to comment. If email address was optional, I suspect many would not provide it. An email address tied to a name does NOT mean the person doesn’t mind being contacted. To assume this is to make big mistake. To assume this is quite possibly putting the person at unnecessary risk. I am deeply concerned with any abuse blog, blog owners, blog contributors that don’t get this simple fact. Oh my goodness, A Mom, what a good point!! A Mom – I loved your comment. Moderating is not a piece-of-cake job. I don’t know that I would have done this blog thing had all of the challenges been explained to me up front. I, too, had to look up sock puppet when the concern was raised to me. I suspect I’ve had between 5 and 10 people tell me NOT to contact them via e-mail because of this very reason. Abuse blogs are very different from other blogs and sometimes lives are at stake. This is a very real concern. The internet is a crazy place. Denny Burk and Pyromaniac and many other bloggers will not allow comments from people who do not disclose first and last name (how they can prove the names are legitimate is a whole other story). I have always allowed anonymous comments because there are legitimate fears in posting real names if abusers find out (my friend, Meaghan, was added to my defamation lawsuit when she decided to comment on my blog using her real name). This sent a clear signal to any former or current BGBC members: that if you dare to make a negative public comment about Chuck O’Neal, you might find yourself in court. That is scary. What you see publicly on the blog is only part of the story. There are also e-mails I get behind the scenes telling me how to run the blog, sharing concerns, etc. The reality is that I have to do what I feel is best for the most people. My default mode is to always defend survivors (which is why I made the unprecedented action to remove key comments on the Schlueter/Driscoll thread when asked by someone). Add to all of this, there are people who do not like what I do and will fabricate stories, start websites/blog posts to put me out. The caliber of comments and credibility here by my commenters, and the content of the posts obviously make me and the blog a threat to reputations if I – and my readers in the comments are exposing stuff. But because of this, some people will resort to behaving very un-Christlike to discredit me, my reputation, or even attempt to trash my family (remember Fred Butler who intentionally posted gossip fed to him about my adult daughter saying she left our home/church because of her sexual immorality). Of course this was completely false, but the outrage and public response to this forced him to publicly apologize (he removed the apology 2 wks later). Butler is a current Bible teacher at Grace Community Church and is a long-time employee at Grace to You – -John MacArthur’s area. This is only one example of the kinds of tactics people, even respected Bible teachers, will resort to when they feel I am threatening the mission or their ministry or a friend’s ministry – – which by the way, probably never was God’s ministry. This is serious business and when there is a moderation situation going on, you better believe it is because of stuff going on behind the scenes or on the blog that cause me great concern. JA, I am so glad you seem to have understood this in the past & relieved you continue to get this. Owning and/or moderating an abuse blog is a big responsibility for sure. Lives are at stake. This is no joke. The hurt & hurting need to be front & center in ALL our minds, whether we are the ones who own, moderate, comment or read. Yes! This is the point. They need to be cared for & protected. Otherwise, it looks like something else. Yuck Yuck Yuck. Have been reading both blogs. First time I’ve ever followed blogs. Totally turned off by both blogs now. I knew DP was messed up before his failures became public but have been collecting info because I know people taken in by him. Plus my legalistic upbringing makes this debacle hit close to home. In spite of TWO Easton’s heavy handed ways I’ll probably still choose Jen’s blog over this one. I’ve left this blog feeling horrible so many times cause we wear skirts, homeschool and don’t do youth group or Sun. school though we don’t believe others who do to be sinning. This blog and comments make me feel like a bad Mom for honoring my husbands wishes concerning these things. This blog “war” pushed me to take sides..So sad. Cannot imagine how those who were taken in by DP and are still on the fence will think after this public spat by those helping to out him. momof6 – You’re a first-time commenter, but I’ve got to be completely honest – your comment has me completely puzzled. I’ve left this blog feeling horrible so many times cause we wear skirts, homeschool and don’t do youth group or Sun. school though we don’t believe others who do to be sinning. This blog and comments make me feel like a bad Mom for honoring my husbands wishes concerning these things. When was the last time we’ve had discussions about women wearing skirts, homeschooling, not doing youth group, Sunday school, etc? Where is all of that coming from? I just do not have the time nor desire to concern myself about these trivial issues. My regular readers do not judge like that. In fact, some of my regular readers are homeschooling moms who are dresses-only and don’t do youth groups. These types of issues are nothing compared to spiritual abuse. Do we talk badly about honoring husbands here? I haven’t seen it. When a wife is loved and cherished, I think a natural response is to honor her husband. I sure would. momof6, this is not about sides, this is about respecting survivors and their feelings, defending the oppressed, helping people get out of destructive and abusive situations. I am learning. You are a wealth of information & you have a heart. Between you & Gary W. I wish that you two could collaborate and write a book that I could refer to for those times the old tapes hammer me. And also to share with my broken, bruised friends who have no idea that is was man’s doctrine that ruined their hope in Jesus. BTW Is it permissible for me to copy & e mail some of your comments ? As I said I am not internet savvy. Grateful for you. Gosh Gail, How kind. I am honored. Of course. I cannot help it, I have really had it with what is going on out there in Christendom. My goal is to help folks get strong and independent of the gurus. I can remember being totally intimidated by the gurus. It took a long time to make my way out of that. LSOP. Thank-You. I wish I had the fire in my belly that you & J.A. have. You are helping more than you might know on this side. Bless You, I am processing & have learned from your words & wisdom. Thank You! Glad that is OK to share your words, I have a few buddies who have been absolutely crushed by doctrines of dead men. You probably remember my old BGBC Survivors blog was a Blogger blog just like yours. SSB is WordPress. You guessed it – -WordPress is not the same as Blogger. I could not see e-mail address on Blogger, but I can on WordPress. I’m not sure about other blogging platforms, however. Kind of keeping in with the theme of this, today last night someone had a change of heart about comments on an old thread. This person used their real first name and was afraid that someone might be able to identify them – – again, for me, it comes down to protect the survivors first. With the Word Press platform, I was able to swap out the name with a new pseudonym, including all corresponding comments which included the real first name. With Blogger, I would have been either forced to leave it as is or delete comments (and corresponding comments). That’s a nice feature of WP. JA, this helps a good deal to know. I have a WP account, but just to re-direct people to my Blogger blog who happen to click through to it because of my WP hostile takeover misdirect of my own comments! p.s. I DO remember your BGBC site. I am writing to tell you that I became aware of this Vision Forum Kerfluffle from a news article. . .then started to follow it. Please excuse the rambling of this message. There are a couple points I wanted to share with you. I am a Christian, have my Masters Degree, a wife, mom, a full time job, a good life. I can’t imagine where I would be without my education. I do not agree whatsoever with these people who want girls to stay home, wait for a guy, and be attentive and obedient to their dad while they do so. But I do see that, that thought process is out there, and followed by many. That said, I wanted to share with you that I stumbled upon your blog from reading this really good site called Free Jinger. You should check out Free Jinger. It is like your blog, clear thinking people, not judging, but critiqueing and giving input for discussion. Thanks for kind words. I am familiar with Free Jinger (the name of the site cracks me up nearly every time I read it). If you are not used to colorful language, you might need to put on sunglasses. But the people there seem to have a pretty good grip of the atrocities going on in these hyper-controlling fundy groups. Wow, you are a Christian woman, have a good life, AND A full-time job. Those are some fighting words in some “Christian” camps. Not here! I want to add comment by Jen to this thread so that I have it documented. This comment was made by Jen at her blog this morning. It is an interesting comment from Jen because further up this thread, we see that she first wrongly accuses me of slander and then defamation. InChristAlone, there was another blogger (JA) who wrote a blog article full of lies about us last week. WFF is apologizing for her part in it, for which I am very grateful. And for the record, I do not believe W4F had anything to apologize about. It’s not wrong for a survivor to speak out when she feels she is being harassed. That’s what survivor blogs are all about – – helping people get their voice back and take a stand against people who behave in bully ways. Apparently, WFF felt a need to apologize and ask them to forgive her. You said: as TW Eston who later apologized to her for his part in repeatedly contacting W4F against her wishes. He did not say that he repeatedly contact her against her wishes…. in his comment….please show where he said that. Also her wishes were that we can all get pass this, so make we should heed her words…just saying. Whether Eston publicly admits that he was repeatedly asked to stop contacting someone is not my concern. I know how he dealt with me personally and I am not the only one who has experienced it. In fact, even on Jen’s site, people have said his behavior is like a bully and neither Jen nor Eston have done anything to rectify the situation. This morning Jen called me a liar on her site and then called me a liar here, yet she failed to provide proof. What I said about her was quoted from her words and linked, so if she was lying in her own quote, I am not responsible for that. WFF is the bigger person for asking everyone to forgive. Maybe “both” blogs should heed her example and do the same because this is not bringing glory and honor the Jesus Chirst. This is so sad all many levels…..
Teresa: Before your comment, the last comment was at 9:04 AM – it is now 6:37 pm. The reason I posted Jen’s comment at 9:04 AM is because she is using legal terms against me: slander, defamation, and now lying on a public forum about me to others. I now have a screen shot of it for my files. As a blogger who has been sued, I understand about covering my tracks. You are the one who is keeping it going now. Just asking you some questions, so now you turn it on me…I see. Like I said sad on many levels………. You ask me to stop yet you asked questions, so I responded. As far as I can see, there was no way to win this. If I had ignored you, then what? What is not bringing glory and honor to Christ? Not having a backchannel? Not shutting up? Seriously, This sort of declaration of “I am a better Christian” because I do not defend myself or speak out is old hat. It is part of the fundy/Cal/Patriarchy that is sooooooooo old and when analyzed…not true at all. Sunlight is the best disinfectant. It is another “red flag”.